What if my grades don’t look right? Get in touch with us! That’s what we’re here for. Please note that it may take up to ten minutes for your most recently earned points to appear in Blackboard, Brightspace, Moodle, Canvas, or any other LMS your school may be using. Sometimes your school’s module numbers and our webtext’s chapter numbers don’t match up exactly. Consult your syllabus to make sure you’re looking in the right place for the points you’ve earned. Make sure you also understand how the webtext grades your work. Use the Notebook tool (or other progress indicators) to make sure you’ve completed everything. 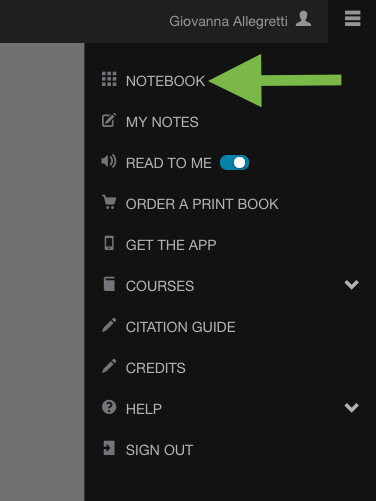 Click the Tools button in the upper right, and then click Notebook.